The menace of odour from fish farms culminated to this study. Previous research works done showed that the major odorous substances from fish farms are ammonia, carbon dioxide and volatile organic compounds all of which are toxic in aquaculture. These compounds are excreted by fish or are products of feed degradation in aquaculture resulting to aquarium pollution. This research is aimed at reducing the concentration of these substances using a microalga; Chlorella vulgaris. This alga was isolated from the pond wastewater using a BG medium described by Mark and Cane. To a fish tank of size 150 × 150 × 150 m3 containing 200 litres of pond water and 200 fish was added 250 mL of Chlorella vulgaris culture and allowed to stand for four hours (4 h). The pond water was made up to 500 litres and incubated for eight days. The control was subjected to the same conditions but without application of the isolate. The ammonia concentration was measured every two days starting from day zero. 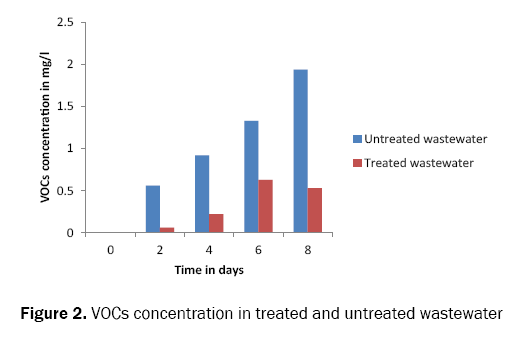 At the end of eight days incubation, ammonia and VOCs concentrations were reduced to 0.23 and 0.53 mg/L respectively compared to the untreated pond (control) of 23.5 and 1.94 mmg/L respectively. Besides, nitrate and total organic carbon reduction were observed at the end of eight days incubation (33.04 and 2.32 mg/L respectively as against control concentrations of 55.72 and 13.66 mg/L respectively). This is attributed to possible utilization as nitrogen and carbon sources for the growing alga. Oxygen generated during photosynthesis also facilitates the oxidation of ammonia to nitrite and nitrate thereby increasing the nitrate level. The study showed that chlorella which is a known live food in aquaculture can also be used to control aquarium odour as well as improve the quality of the pond water. Odour has become a problem in our environment in recent time especially in the urban towns. This is largely due to indiscriminate discharge and dumping of municipal solid and wastewater into unauthorized places. Besides, improper waste treatment prior to discharge is a major factor. These wastes that are discharged into the environment include agricultural wastes from poultry, piggry, cattle ranches and fish farms. Synthetic deodorants used to control odour from these wastes are found to illicit adverse reactions on users hence the need for more friendly deodorants. Microbial odour control is gradually being exploited and it involves the use of nonpathogenic microorganisms to metabolize odourous substances or prevent their production by antagonizing and eliminating microorganisms that generates them. According to Ringo et al. , there are numerous microorganisms that are beneficial to fish by restoring water quality and creating a conducive culture environment. These microbes, act as water conditioner by stripping off the nitrogenous substances. The enzymes produced by these microorganisms degrade organic accumulated debris from the cultures inducing ponds bioremediation and consequently the prevention of viral and bacterial diseases . These bacteria provide the waste treatment by removing pollutants. The two primary water pollutants that need to be removed are fish waste (toxic ammonia compounds) excreted into the water and uneaten fish feed particles. The biofilter is the site where beneficial bacteria remove (detoxify) fish excretory products, primarily ammonia . In addition to toxic ammonia, carbon dioxide tends to concentrate in intensive fish production systems. As carbon dioxide increases, the pH of the water decreases, and fish respiration is affected [3,4]. Carbon dioxide levels should be maintained at levels less than 30 mg/L for good fish growth . Some carbon dioxide is beneficial since it reduces pH and mitigates ammonia toxicity. Carbon dioxide removal can be accomplished by the photosynthetic activities of aquatic green algae. These algae utilize carbon dioxide in the synthesis of plant carbohydrate and in turn release oxygen into the aquatic system. The release of oxygen ensures continued aerobic state of the pond and maintains healthy state of fish in the aquarium. The concentration of gaseous pollutants must be controlled and reduced, not only because of their emission into the atmosphere, but also because of the health hazard to farm animals. In this study, the role of Chlorella vulgaris will be investigated determine its potential for odour control in fresh water fish farm. The objectives of the study are to determine the physicochemical characteristics of the pond wastewater isolate and characterize Chlorella vulgaris from wastewater of a fish farm, determine the effect of microbial deodorants in fish wastewater using the isolate and to measure ammonia concentration, volatile organic compounds and total organic carbon and nitrate concentration at various stages of the study. This study was carried out at Rexall Research Laboratory in Port Harcourt, Nigeria. Two fish ponds were sampled located at No. 1 Awonobasi Close, Gbei Road, Nkpolu Rumuigbo in Obio/Akpor Local Government Area of River State. The ponds size was 150 × 150 × 150 cm3 each and accommodated 200 fish, of age three to six months old with an average weight of 400 g to 700 g, each respectively. Fish feed type and components were to be determined. Skretting fish feed (catfish superior 6.0 mm) was used (Picture 1). The water sample was collected from a depth of 40-50 cm from the surface of several locations on the ponds using a 250 mL sterilized glass, precisely a conical flasks and taken to microbiological laboratory for analysis (Picture 2). Also, samples were collected from fish intestine. The intestinal contents were collected aseptically and cultured in a special culture media [6,7]. BG medium was prepared according to the method of Mark and Ceane . A 20 mL of pond water was filtered into 50 mL Erlenmeyer flask in duplicate. To each flask was added 200 mL of BG medium. Both flasks were incubated under sunlight for two weeks in accordance with Odokuma and Smith . Serial dilution of culture showing green coloration was made and 0.1 mL of 103 dilutions seeded into a BG agar plate  fortified with 100 μg/ml of Nystatin and 80 μg/mL of Gentamycin  and incubated under the above conditions. The plates were observed weekly for growth. Microscopic examination was done. Discrete colonies was sub-cultured into BG medium and used as stock culture . A glass slide was cleaned before the sample was loaded by rinsing the slide and cover slip with 70-95 % ethanol. Both the slide and cover slip were air dried or gently wiped with lens paper. Using a micropipette, 10 μL (or 1 drop) of sample was loaded to the v-shaped groove of the haemocytometer. The charged haemocytometer was placed under a compound microscope to visualize the grid. The number of cells in the 4 outer squares was counted. (If 1 mL of sample is diluted with 10 mL of distilled water, dilution factor is 10). The following parameters were determined; biochemical oxygen demand (BOD), total organic carbon (TOC), nitrate concentration, phosphate concentration, pH, temperature and sulphate concentration prior to and after microbial treatment using standard methods . This was done using a colorimeter for ammonia , spectrophotometer and gas chromatography to measurement of VOCs and titration for the estimation of carbon dioxide . To a fish tank containing 200 litres of pond water and some fish was added 250 mL of Chlorella vulgaris culture and allowed to stand for four hours (4 hrs). The pond water was made up to 500 litres and incubated for eight days. The ammonia concentration was measured every two days starting from day zero. The physicochemical properties of source, waste and treated water samples is represented in Table 1 and showed high level of ammonia, nitrate, volatile organic compounds and organic carbon on the eight day. Table 1, also showed the level of pollution of the pond wastewater. Table 2 captured the population of the alga (Chlorella valgaris) in the different pond environments. The fish intestine recorded a count of 2.2 x 105 on the eight day as against 0.8 x 102 on day zero. The highest count was recorded from pond wastewater on the eight day with a total cell count of 7.0 x 108 CFU/mL. The potential the isolate to reduce odourous compounds was illustrated in Table 3. On the eight day, the isolate was able to reduce ammonia (1.95 mg/L) and VOCs (0.83 mg/L) compared to the initial concentration in untreated wastewater of ammonia (23.25 mg/L) and VOCs (1.94 mg/L), respectively. Table 1. Physicochemical properties of the fish pond wastewater. *Acceptable environmental standard (FEPA, 1991). Table 2. Total algal count (cfu/mL). Table 3. Screening Isolate for Ammonia and VOCs reduction (mg/L). Table 4 showed the progressive increase of nitrate, ammonia, volatile organic compounds and organic carbon with nitrate having the highest value of 55.72 mg/L, followed by ammonia (23.5 mg/L), total organic carbon (13.66 mg/L) and volatile organic compound (1.94 mg/L). Table 5 showed the results of the parameters measured. There was an exponential increase in ammonia concentration until day six, followed by a sharp decline ( 0, 0.49, 1.7, 0.59 and 0.23 mg/L). It was not the same with total organic carbon that had a steady increase till day eight (0, 0.24, 0.95, 1.50 and 2.32 mg/L). The VOCs showed increase till day six followed by a slight decline (0, 0.06, 0.22, 0.63 and 0.53 mg/L) while nitrate recorded an increase to day six followed by a slight decline on the eight day. The analysis of variance done showed similarity (<0.05) on the pattern of ammonia and VOCs reduction but not total organic carbon. There is, also, no significant difference at 95% degree of freedom between nitrate and VOCs reduction. Table 4. Measurement of odourous substances in untreated wastewater sample. Table 5. Determination of the microbial deodorant property of the formulated microbial liquid supplement. Chlorella vulgaris demonstrated its ability to reduce ammonia and VOCs concentration in an aquaculture as demonstrated in Figure 1 and 2 above. This is in line with the work of Ringo et al. which states that numerous microorganisms are beneficial to fish by restoring water quality and creating a favourable culture environment. These microbes, act as water conditioner by stripping off the nitrogenous and other toxic substances. According to Sorokulova , the two primary aquarium pollutants that need to be removed are fish waste (toxic ammonia and volatile organic compounds) excreted into the water and uneaten fish feed particles. This microalga acts as either biofilter or utilizes nitrate present in the wastewater for synthesis of plant protein. Ammonia released by fish into the aquarium can be oxidized to nitrate using oxygen generated by the Chlorella species during photosynthesis hence reduction in nitrate concentration on the eight day (Table 5 and Figure 4). Figure 1. Ammonia concentration in treated and untreated wastewater. Figure 3. 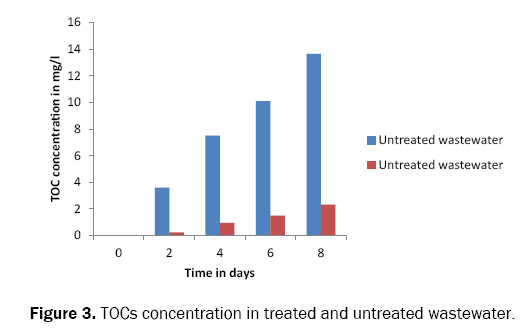 TOCs concentration in treated and untreated wastewater. Figure 4. Nitrate concentration in treated and untreated wastewater. The temperature, pH, dissolved oxygen, NH3 and H2S in rearing water were found to improve upon application of Chlorella vulgaris. This is supported by the works of Banerjee et al. and Aguirre-Guzman et al. . In addition to toxic ammonia, carbon dioxide tends to concentrate as shown in elevated total organic carbon as illustrated in Table 5 and this may affect the general health of the fish. Carbon dioxide levels should, therefore, be checked. Louis and George  and Brown et al. opined that carbon dioxide levels should be maintained at levels less than 30 mg/L for good fish growth. Some carbon dioxide is beneficial since it reduces pH and mitigates ammonia toxicity. Carbon dioxide removal can be accomplished by the photosynthetic activities of aquatic green algae (Figure 3). These algae utilize carbon dioxide in the synthesis of plant carbohydrate and in turn release oxygen into the aquatic system. The release of oxygen ensures continued aerobic state of the pond and maintains healthy state of fish in the aquarium. This study has proved Chlorella vulgaris a veritable tool in sustainable aquaculture development as odour control agent in fish farm wastewater. In this vain, it complements its role as live food to fish and other aquaculture species. It purifies aquaculture by detoxifying toxic substances generated by fish and other aquaculture species. Carbon dioxide produced in aquaculture is used by the microalga during photosynthesis and oxygen produced can facilitate ammonia transformation to a less toxic nitrate. In this vain, it is recommended that emphasis must been given to this new area with the aim at mitigating not only environmental air pollution but also improving the productivity and quality of aquaculture business. Ringo E, et al. Epithelium associated bacteria in the gastrointestinal tract of Arctic charr (Salvelinus alpinus L.). An electron microscopical study. J Appl Microbiol. 2001;90:294-300. Sorokulova I. Modern status and perspectives of Bacillus bacteria as probiotics. J Prob Health. 2013;1:1-5. Gatesoupe FJ . The use of probiotics in aquaculture. Aquaculture. 1999;180:147-165. Burgess JE, et al. Developments in odour control and waste gas treatment biotechnology: a review. Biotechnol Adv. 2001;19:35–63. Brown MR, et al. Nutritional properties of microalgae for mariculture. Aquaculture. 1997;151:315-331. Mark JS and FA Creane. Isolation and characterization of some UV-induced mutants of Chlorella vulgaris prings. J Pharmacol Sci. 2006;57:2038-2044. 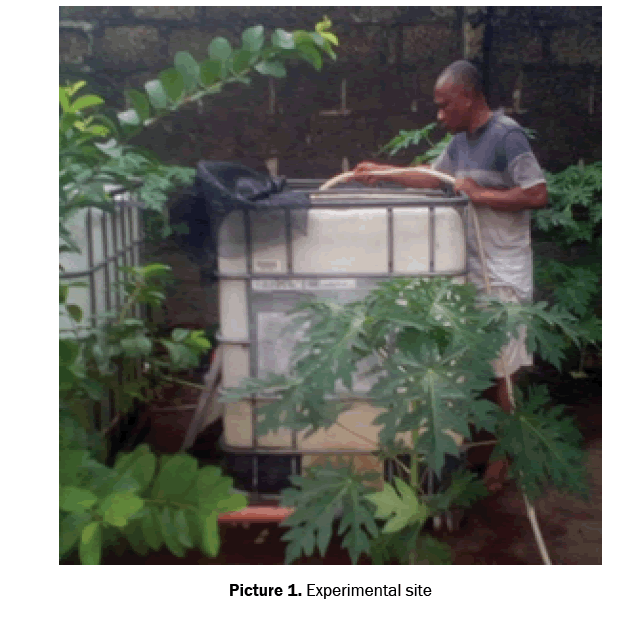 Odokuma LO and Smith VA . Biodegradation of a nigerian crude oil by microalgae and Cyanobacterium. Trop Freshwater Biol. 2007;16(1):17-30. Onianwah IF. Bioremoval of heavy metals from effluent of Port Harcourt Refinery Company limited, Eleme, Nigeria. Int Res J Environ Sci. 2014;3(5):73-79. APHA. Standard Methods for the Evaluation of Water and Waste Water. 20th Edition, American Public Health Association Inc., New York, Washington DC,1999. UNEP. United Nations Environmental Programmes, Analytical Methods for water quality. Burlington publishing house, Ontario, Canada, 2004;160. ISO International 0rganization for standardization; sampling methods; 1988;180:5667-13. Banerjee S, et al. Enhancement of Penaeus monodon shrimp postlarvae growth and survival without water exchange using marine Bacillus pumilus and periphytic microalgae. Fish Sci. 2010;76:481-487. Aguirre-Guzman G, et al. The use of probiotics in aquatic organisms: a review. Afr J Microbiol Res. 2012;6(23):4845-4857. Louis AH and George L. Fish farming in recirculating aquaculture systems (RAS). Department of Fisheries and Wildlife Sciences Virginia Tech. 2012;5:1-19.